Finally a restaurant after my own heart! Urban Plates is bringing real food back. From the moment you step into the beautiful open style kitchen you will be pleased with the vast display of incredible food selections. 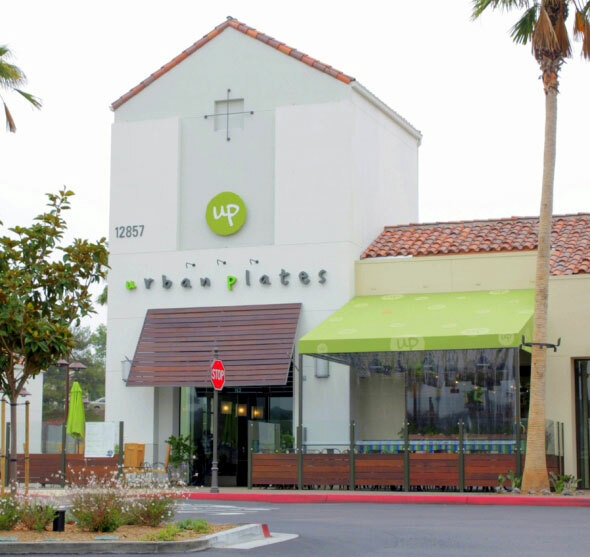 Why does Urban Plates stand above the rest? Everything is prepared from scratch using local high quality, natural and organic ingredients. The lunch and dinner selections include Tossed salads, Hand Carved Sandwiches, Hot Entrees, Slow Cooked Braises, Pizzettes, Soups and Hot/Cold Sides. Dining with the kids? The Urban Kids menu choices consist of popular favorites like Mac N Cheese, and PB and Jelly. If that isn’t enough to make you smile, the baked goods section is visually outstanding and when you take your first bite into the delectable desserts you will be planning your next visit. Every experience at Urban Plates has been enjoyable for me. The ambiance is refreshing; the friendly staff is accommodating and best of all I know that I can choose from a number of healthy selections like their unique version of Tabouleh, their outstanding Herb Marinated Roasted Chicken and their refreshing Fresh Squeezed Lemonade sweetened with Agave Nectar. On days that I can’t resist I treat myself to their over the top Blueberry Coconut Muffins. Best of all, Urban Plates won’t empty your pockets. Their prices are reasonable and they offer family style portions for curbside pick up. It’s the closest you’re going to get to healthy home-cooked food!